Did you know… that the hashtag is so recognized that it was added to the Oxford Dictionary and the Scrabble Dictionary? ‘Hootsuite’ describes the hashtag as follows: The hashtag is likely the most popular means of categorizing content on social media. It makes your own content discoverable and allows you to find relevant content from other people and businesses. The hashtag also allows you to connect with and engage other social media users based on a common theme or interest. -Result: Entering into a completely different conversation online. On Monday I tweeted : @ChessClassic:#CarlsenKarjakin seems to be the best hashtag for the match. Any other suggestions? #WCCCNYC2016AGONFIDE perhaps? It did not take long before I got answers and suggestions: @TarjeiJS: #WorldChess2016 seems to be used by some prominent Agon people, but I refuse to use it! @asimpereira wrote: “Then thank goodness @lachesisq is not one of the players is not one of the players”. In case you are wondering who the person behind that handle is: Yan Nepomniachtchi, the Russian grandmaster who used to work in Team Carlsen, but decided to support Karjakin this year. @pookita replied: “We’re worried about your young “double Anand.” He’d bury us in letters”. She speaks of Rameshbabu Praggnanandhaa, the 11-year old who is on his way to become the youngest GM ever. The hashtag #NepomniachtchiPraggnanandhaa comes to mind. Other suggestions: @yasssir: #CarVsKar, or even shorter: #CarKar, as suggested by @youssefrahoui. @asimpereira: “How about #WorldChessChp ? (self explanatory + easy to spell + puts chess ahead of individuals)”. I think using the players names makes sense, therefore I will vote for and use #CarlsenKarjakin during the world championship. #WorldChess2016 refers to the official website, and from an organizers point of view this hashtag is understandable. However, as @lladini puts it: “No outsider would remember or feel curious about stuff like #FWCM2013 or #WorldChess2016”. In other news on Tuesday: @kajasnare: “Just met @SergeyKaryakin at breakfast in NYC. Reports he is feeling good 3 days to go #worldchess2016”. The question is: @ChessClubLive: “You are going to have breakfast with @MagnusCarlsen also?” @kajasnare: “He is invited. Got a feeling I will be stood up”. What is your prediction? Send a tweet to @ChessClassic. Having a two-year break from world championship blogging was actually quite nice, but let’s go on with the blog! This time, I am a neutral observer….. 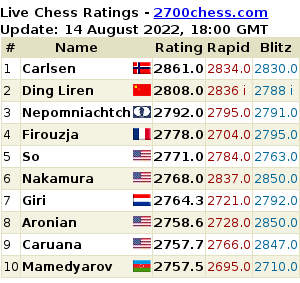 In the next weeks the World Championship Match between Magnus Carlsen (Norway) and Sergey Karjakin (Russia) in New York will be the main topic in this blog. After the match, I plan to give you a weekly overview of the most interesting chess related tweets. The trick still works, even a few days before the match. Sergey obviously does not seem to have a good social media expert in his team. Check this tweet by @GMIanRogers: “A Couch Potato’s Guide to the World Chess Championship match – options for watching Carlsen v Karjakin online.” https://new.uschess.org/news/the-couch-potatos-guide-to-the-world-chess-championship. Let’s have a look what the players post on Twitter. As a chess fan, you should add the accounts @Magnus Carlsen, with 130.000 followers and @SergeyKarjakin, who has 18.100 followers (6 November 2016). Sergey and Shak touching balls in Miami. They boys do not tweet very often though, and I can tell from experience that the players will probably not tweet very often during the match. Attention: Follow the account @GaliyaChess, which is the account of Sergey’s wife Galiya Karyakina. You will not only be able to see the result of her shopping sprees in New York, but maybe some other stuff as well during the match. You might think that 130.000 followers (Carlsen) is quite a lot, but when you check the site http://twittercounter.com/ you will see that the athlete with the most followers is Christiano Ronaldo @cristiano with almost 48 million followers. Reality check: Chess on Twitter is in the same league with sports like Darts, Table Tennis or Snooker. “So, 2016 World Chess Championship (two years since last one) starts in five days. Where’s the media blitz? Maybe we better postpone the whole event, right? BTW: do we have an official match hashtag yet? Send in suggestions to my acccount @ChessClassic. And if you see any interesting tweets or do have an interesting chess related account yourself, send a tweet to @ChessClassic. Thanks!